Who doesn’t need another game to add to the old toolbox? This one rarely makes it into my lesson plan, but we often play it when we have a few minutes to spare at the end of the class. 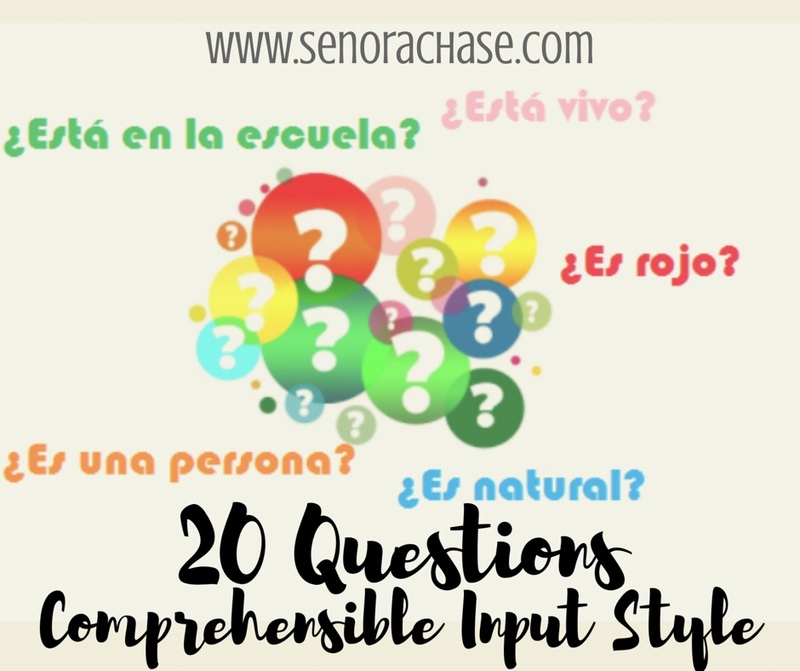 It’s the typical 20 questions game, but with a few twists to ensure they’re still getting lots of comprehensible input. Divide the class into 5 or 6 teams. That’s all! How’s that for low prep!? If you teach a language other than Spanish, just send me a note and I’ll send you an editable version of this slide so you can translate it. And if you’re feeling especially generous, can I include your translation here for others to use? Explain the rules: The 1st team will ask a yes/no question from the slide, the teacher will answer then the 2nd team will ask a question, then the 3rd team and so on. If a team figures out the item, they can guess out of turn by raising their hand. (So let’s suppose it’s team 4’s turn but team 1 thinks they know the answer. They can raise their hand to guess) BUT… there’s a risk. If the team guessing is correct, they win the round. If they are wrong, they are eliminated for that round. (Don’t worry, they’ll still get lots of input and the rounds go fast). If a team wants to guess during their turn, there is no penalty for guessing wrong, they are still in the game. Of course, a CI teacher will not just answer Sí. You see a ripe opportunity for more input! Yes, it is bigger than Jeffery. It’s much, much bigger than Jeffery. Really, it’s bigger than Jeffery and Savannah combined! Now it’s team 2’s turn to ask a question: Is it alive? Now here’s the twist, the teacher answers the new question and repeats all the previous clues too! No, it is not alive. It’s not dead either. It’s not alive or dead because it is an object. And remember, it’s bigger than Jeffery. Team 3 asks: Is it in the classroom? Teacher: Yes! Very good! It is in the classroom. But there isn’t just one in the classroom. There two in our classroom. Hmmm… there are two in our classroom, look around. There are 2 of these things in our classroom and they’re not alive. And they’re bigger than Jeffery. What could they be? SO MUCH REPETITION, PEOPLE! And all the Es and Está input! C’mon! It’s a good one! Play it! And so on until a team guesses it. Then play another round. If we have a time to play a few rounds, I give a poker chip to the winning team to indicate they have 1 point.. I think it’s so much easier to give them something to indicate their points, rather than me keeping track on the board. When I used to keep track on the board, I got real tired of their whining: You gave them too many points! You didn’t give us a point! Your math is wrong, their score should be 17. I like poker chips because kids feel like they’re valuable…that might just be us, we’re in Nevada. At the end of class, the winning team brings me their stamp sheet for a stamp and return my poker chips. We played this using your slide for guidance in my Spanish 2 class Friday after a quiz and it was a HUGE success! I played me against the class. I said if they won, they could have the rest of the class free. Well, it took 25 minutes to play, they were so into it that, although they won (I helped them win), they only got 5 minutes free but they didn’t care! THANK YOU SO MUCH! Awesome!! What items did you pick? I need some new ones to add to my list!! Sometimes I panic and can’t think of anything good so I pick a kid in class which is hilarious! I’m still trying to figure out what in your classroom is bigger than Jeffrey? Also, what kind of items do you choose? This looks like so much fun. Feel free to email me the slide and anything else you would like translated to French. Could you please email me the slide and I can change to Mandarin？Thanks! Yes! I shared the document with you! Thank you!